NOAA and partners from 12 organizations surveyed sites in the Florida Keys to determine the extent of coral bleaching, and death, in the wake of record low-water temperatures. Scientists assessed coral health at more than 78 sites from January 25 to February 12 to determine the severity of coral bleaching and reefs most affected. 20 degrees Fahrenheit lower than the typical temperatures of the upper 60s and lower 70s. 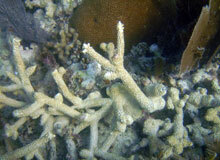 The lethal lower limit for corals is 60 degrees Fahrenheit. According to reef biologists, the influx of cold water from Florida and Biscayne bays appears to be responsible for the coral deaths in nearshore waters of the Florida Keys National Marine Sanctuary. The hardest hit areas were the inshore and mid-channel reefs from Biscayne Bay (southeast Florida) to Summerland Key (island in the Florida Keys). Fortunately, the offshore reefs most frequented by divers and sportfishers were buffered by warmer waters of the Florida Current and spared severe impact. Coral bleaching occurs when corals, stressed by changes in conditions such as temperature, light, or nutrients, expel the symbiotic algae living in their tissues. This survey data will support greater understanding about coral reefs and guide efforts to protect these critical habitats. Researchers are still exploring whether this cold-stress event will make corals more susceptible to disease. Following warm-water stress events, the bacterial makeup of corals changes, increasing the prevalence of coral disease. This winter’s event allows scientists to collect data to compare and contrast coral health following both cold- and warm-water events. Florida Keys National Marine Sanctuary, the manager of most Florida Keys coral reef resources, is working with the science community and limiting certain consumptive activities in the hardest hit areas until stressful conditions subside. The Sanctuary is also asking SCUBA divers to enjoy the many reefs not affected by January’s cold weather. Program partners include The Nature Conservancy, Mote Marine Laboratory, Florida Keys National Marine Sanctuary, the National Park Service, Florida Department of Environmental Protection, Florida’s Fish and Wildlife Conservation Commission, the University of Miami, Nova Southeastern University, John Pennekamp Coral Reef State Park, Broward County, and Miami-Dade County.